Kranium's "Nobody Has To Know" is one of the most enduring dancehall songs this side of the aughts. Since it first dropped two years ago, it's been a bashment mainstay, perfect for dark corners and sweaty summer nights. The Atlantic signee recently recruited Ty Dolla $ign for a new version, and today he's dropping a video to go along with the DL-themed track. In the brightly hued video, Kranium skillfully evades paparazzi on a hoverboard before scooping his (presumably taken) woman and pulling up to a trailer for a middle-of-nowhere desert romp. Ty Dolla $ign is in the cut too, rolling through on a motorcycle with a fat blunt dangling from his lips. "Videos need to be creative and I think we pulled it off. 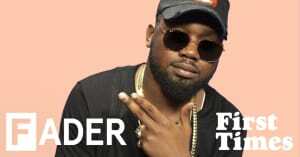 This is not your typical dancehall video,” Kranium told The FADER over email. Accurate. Watch the video above, and hit the clip below for some behind-the-scenes views.